There’s a common misconception that Ingmar Bergman made only glum philosophical dramas, but his work is not without its life-affirming moments and he ventured into a variety of genres over his long career, including comedies. 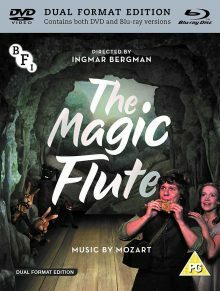 Perhaps the most surprising film in his career however is The Magic Flute, a filmed staging of Mozart’s famous opera for TV. Now, I’m a lover of music in most forms and was classically trained as a pianist as a boy, but I must admit I’ve never sat through a whole opera. I’m at the stage in my life where I feel I should though, so, added to being a fan of what ashamedly little I’ve seen of Bergman’s work, this was a must see for me. Working from a Swedish translation by the poet Alf Henrikson of the originally German libretto by Emanuel Schikaneder, Bergman made a few changes. Due to my poor knowledge of Mozart’s opera, I can’t really comment on their success or failure though (and one of the major changes is a bit of a spoiler). The story sees Prince Tamino (Josef Köstlinger) saved from a dragon by three attendants to the Queen of the Night (Birgit Nordin). Tamino passes out and when he awakens meets the jovial yet lonely Papageno (Håkan Hagegård), who makes a living catching birds and claims responsibility for slaying the dragon. The three attendants soon set Tamino straight though and punish Papageno for his lies by placing a lock over his mouth (which is opened not long after). The ladies also give Tamino a portrait of the Queen’s daughter, Pamina (Irma Urrila). He falls instantly in love with her and, when he hears she has been abducted by the evil Sarastros, vows to save her and make her his wife. The Queen hears this and agrees to let him have her hand if he brings her beloved daughter back. So Tamino heads off to save the princess, along with Papageno and two special items given to them by the Queen; some magic bells and the titular flute. Both possess the ability to fill those listening with love, peace and happiness. Aided by these, Tamino and Papegeno find Pamina rather quickly, but realise there’s more to the abduction than meets the eye. This is a very difficult film to review for me as I know little of opera and it’s a very straight and theatrical presentation of a particularly famous operatic work so I have little to compare it to. Being a newcomer to it all, I can say I enjoyed the experience though. I do appreciate classical music (although I’m not particularly knowledgable in it) and the performance of Mozart’s work seemed very good to my ears. The look of the film is interesting too. Bergman wanted to recreate a performance as it might be at the original time of the opera’s premiere in 1791. So the sets, costumes and stage effects are simple, but beautifully realised. There are some lovely moments such as the changing of season from winter to spring through a leafy net curtain dropping over a previously bare tree in the painted backdrop. Bergman does move out of the realm of traditional theatre in a couple of scenes though, with one looking like it was shot on location and another incorporating some pyrotechnics and more modern interpretive dance. He breaks the fourth wall too in opening with a long montage of shots of the audience and frequently cutting back to one young member in particular (some believe it’s Bergman’s daughter, but this is reportedly not true). For the most part though, it’s a warmly traditional affair. The imagery is often quite striking too, despite this simplicity. A lot of the film is shot in straight forward close ups or two shots, but some of the wide shots are incredibly beautiful. 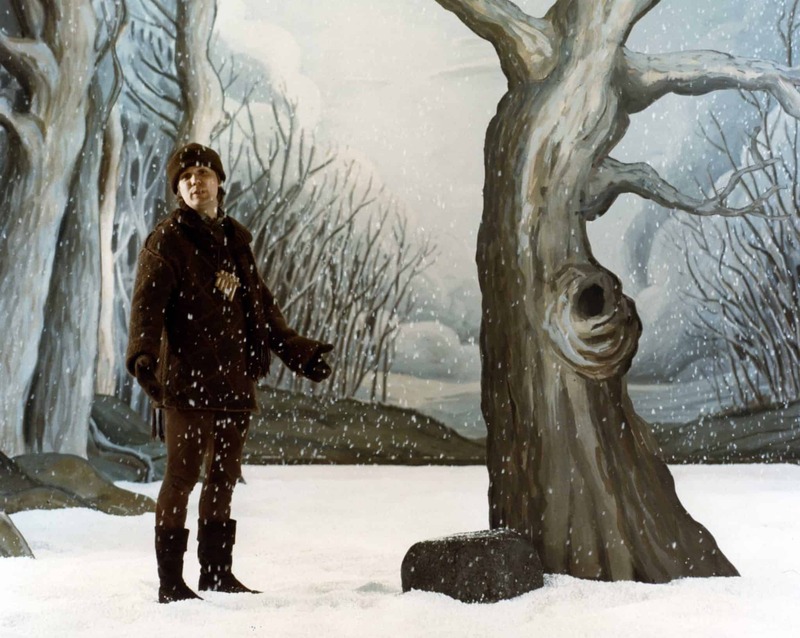 The latter half of the opera in particular contains some of the more visually impressive sequences. A journey through hell (or some sort of fiery realm) is one such example. Without wanting to reveal myself as a philistine, I did find the operatic form presented some issues I suspected I might have with the medium. Namely I found it a little patience-testing at times, largely due to the fairly slight story being drawn out through lengthy melodramatic musical sequences. Thankfully it’s one of the lighter classic operatic works though and a nicely dramatic final act helped bring me around towards the end. I appreciated having English subtitles translating the lyrics too as I’d find it hard to follow and sustain interest otherwise. 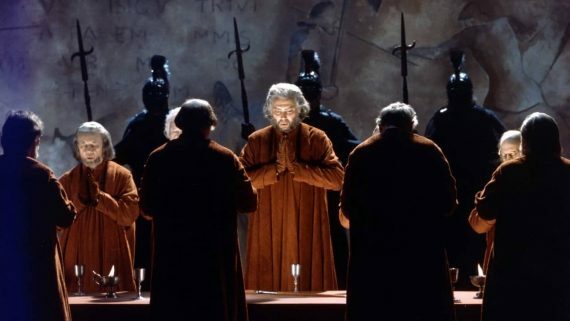 Being an operatic virgin then, you might not want to put too much stock in my opinion of the film, but if you’re in a similar boat to me I’d recommend you give it a go. I’m certainly willing to delve deeper into the world of opera now and I might give this another try once I’m more familiar with it. The Magic Flute is released on 23rd April on Dual Format Blu-Ray & DVD in the UK, released by the BFI. I saw the Blu-Ray version and the film looks a bit soft (it was shot on 16mm though, so this is understandable), with some strange grain issues on brighter skin in the audience close ups. The audio comes through nice and clear though.